Cybersecurity Ventures suggest that 300 billion passwords will be in use by 2020! The average internet user uses 90 accounts that require passwords. How do we remember them all? One Naples, Florida marketer uses the same core content for all passwords and then tacks on unique combinations related to the site to help her remember them. Homeland Security says to use different passwords on each account. 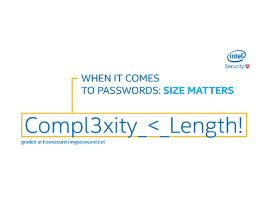 One expert suggests that longer (not more complex) passwords are easier to remember but tougher to crack.